I accidentally started reading this series out of order...but thankfully, it works! I read The Thief earlier this year part of a blog tour. My goodness! What an amazingly gripping story. I knew I had to go back and read the first book when I had time. 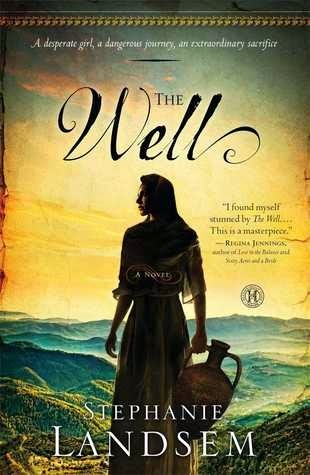 The Well was a story that is just beautifully written and has such an emotional depth to it. You ached and hurt for these characters. And you got angry for them as well. There is a strong emotional pull that keeps you reading. I finished this book in a few hours. It was hard to set down. I have heard the story about the women at the well many times in church. I've heard different sermons and teachings on it. It's always been about Jesus' perspective of it or the social perspective of it. Here, we see it from the woman's standpoint and in a very realistic way. We get to see an idea of who this woman is. What her life was like and if she had family, other then her five husbands and the one who wasn't her husband as it is pointed out in scripture. Neva was once beautiful. She was married and happy, but before she gave birth, her husband died. In her suffering she named her daughter Mara, for bitterness and sorrow. From there, Neva's life took a turn down a dark road. When we are introduced to Mara, she is a young woman, caring for her depressed mother and her disabled brother. Mara at a young age knows the sins her mother is committing will harm her family in some form or fashion and Mara suffers the abuse of the townspeople since her mother rarely leaves their house. Mara is a strong girl. She faces torment and harassment, but she does her best to hold her head high. She fights an internal struggle over the feelings of her mother and of herself as well, but when Jesus visits the town and she hears him speak after her mother is healed at the well, Mara gains a new hope. You can't help but root for her, to help her along on her journey. This story took a few twists I was not expecting. The ending left me stunned! I had to pick my jaw off of the ground with the turn around of events. However, it all fit together like the perfect puzzle leaving you breathless and wanting more! My goodness! It ended to soon. From beginning to end, this story wrapped you up in an emotionally filled story, that was also historically accurate. There is brutality in this story, I will say, but for this time, it is how it was. It gave it such a realistic feel. Some of this type of brutality is still around today, sadly. This story, no matter the year, is just as important as it was in Biblical times. I can not wait to read the third book coming out next year in The Living Waters Series, The Tomb. I recently read my first novel in the Biblical fiction genre (In The Field of Grace by Tessa Afshar) and really enjoyed it. This book sounds really interesting as well. I'll have to add it to by booklist! DLKamstra, I just finished In the Field of Grace as well. Tessa Afshar is a fantastic author. I hope you enjoy diving into Biblical fiction. I really enjoyed The Well and The Thief.